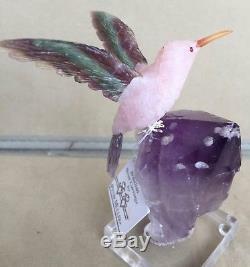 Beautiful Hummingbird carved from Rose Quartz and Fluorite. 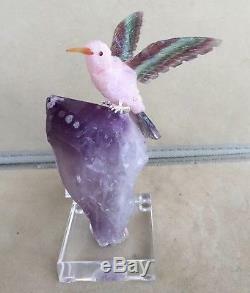 The bird is perched on a nice Amethyst Crystal. 5" tall including the base with the bird itself 3 1/4".. 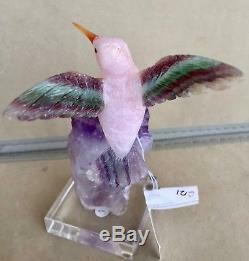 The item "Rose Quartz/Fluorite Hummingbird on Amethyst Crystal 5 -Peter Muller" is in sale since Sunday, December 16, 2018. This item is in the category "Collectibles\Rocks, Fossils & Minerals\Stone Carvings". The seller is "rcorock" and is located in Colrain, Massachusetts. This item can be shipped worldwide.